Authorities in Sierra Leone are reported to have launched raids on illegal diamond trading offices in the east of the country. United Nations radio in Sierra Leone says police and officials from the ministry of mineral resources seized mining equipment and offices in the town of Kenema. It said several shop owners were taken in for questioning then released. 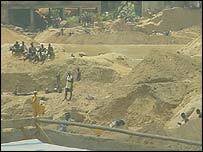 Correspondents say the operation could be extended throughout the eastern region of Sierra Leone where diamond trafficking is rife as the gems cross the border to neighbouring Guinea or Liberia. In an attempt to combat gem smuggling across the border, last month the government of Sierra Leone announced plans to restrict the residency rights and movements of foreign nationals within designated diamond mining areas. It is believed that the measures would affect Lebanese, Guinean, Gambian and Malian diamond dealers, who are often accused of benefiting from the illicit trade. The trade in what are known as "blood" diamonds was one of the main causes of the decade of civil war in Sierra Leone which ended three years ago. Thousands of children were used as labourers in the diamond mines during the fighting. Some as young as seven are still being used by dealers, despite government efforts to get them into schools. The ministry of gender and children affairs have registered 1,200 child miners, with the aim of taking them out of the diamond mines of Koidu in the north-eastern district of Kono.